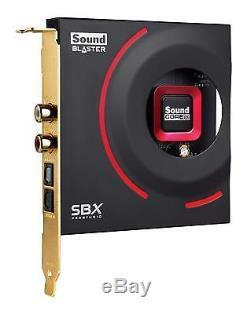 CREATIVE PCIe Sound Blaster ZxR 24bit 192kH SB-ZXR-R2 New From Japan. 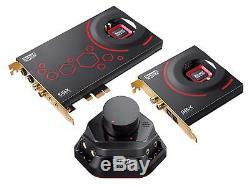 Top model of PCIe Sound Blaster Z series! 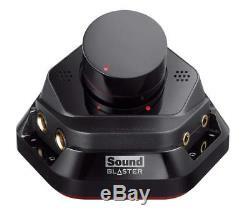 Windows 10 compatible studio grade Audio quality and flagship model PCIe Sound Blaster ZxR is a studio grade audio quality sound card. Very high quality DA converter · Adopt high quality audio components sticking to sound quality such as AD converter and capacitor, replaceable operational amplifier etc. In addition to the main card which mainly includes audio output such as 5.1 ch output including gold-plated front output (RCA) and headphone output, it consists of two DBPro daughter cards equipped with line input and optical digital input / output. Also comes with an Audio Control Module that can connect headphones and headset at hand. Adopting sticking audio components such as studio grade DA converter and various capacitors, with superior circuit design with very low noise of S / N ratio of 124 dB with measured card value, clear clear reproduction environment Realization. With SBX Pro Studio technology you can watch movies on PC, provide more powerful and realistic feeling to the game, and stereo direct output mode which enables high-quality stereo output of 24 bit / 192 kHz processing creates a wonderful environment for listening music. Equipped with a headphone output terminal equipped with a headphone amplifier that can be driven even with headphone at maximum output of 600. The analog input component also adopts the professional grade object, and audio recording with clear sound quality of S / N ratio of 120 dB is possible with card actual measurement value. Scout mode which is indispensable for games. It is possible to feel a minute movement with sound by highlighting the environmental sound in the game such as "footsteps". In addition, CrystalVoice technology, you can enjoy friends' voice chat more clearly and comfortably with 5 functions. Audio Control Module with high quality stereo microphone array built in. Also equipped with headphone output and microphone input, you can connect at your fingertips when using your favorite headphones or headset. A more convenient headphone volume knob allows you to quickly adjust the volume during private listening. International Buyers - Please Note. 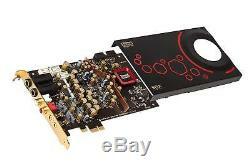 The item "CREATIVE PCIe Sound Blaster ZxR 24bit 192kH SB-ZXR-R2 New From Japan" is in sale since Thursday, November 22, 2018. 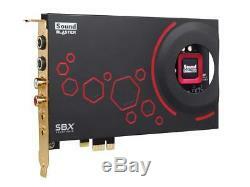 This item is in the category "Computers/Tablets & Networking\Computer Components & Parts\Sound Cards (Internal)". The seller is "yurkim_1" and is located in Hamamatusi. This item can be shipped worldwide.